Here at Dr. Fattahi's Dental Practice we provide the highest quality dental care in a friendly and relaxing environment. At our Dental Practice we specialize in dealing with anxious and nervous patients. - Forget everything you've heard about teeth straightening. - Because now there's breakthrough technology that lets you get the smile you always wanted without bands, brackets, or wires. - Invisalign invisibly straightens your teeth with a series of custom-molded aligners! If you're like most people, when you hear the word "retainer," you probably think of dental braces. The image of a small plastic device with some metal wires sticking out might even come to mind. Although orthodontic retainers are most commonly associated with an orthodontic dental treatment plan, they are used for other things, too, including the treatment of sleep apnea. Retainer therapy involves the use of specially fitted oral appliances. There are many different types of retainers, and which is best for you depends on the specific structure of your mouth and the condition being treated. Most can be removed easily and are designed to be worn while you sleep, much like a night guard. After dental braces come off, most people wear an orthodontic retainer. That's because the teeth need a little time to settle into the jawbone and soft tissue that holds them in their new position. Orthodontic retainers can also be used to close a space between teeth or just to move one tooth in cases where dental braces aren't needed. Ensure you have the smile you've always dreamed of by investing in cosmetic dentistry supported by state-of-the-art technology and a team of highly qualified dentists. Choose from popular options such as teeth whitening treatments, veneers and dental implants and rest assured that our dental team is able to offer you exceptional customer care. Wanting to have a perfect smile isn't merely a question of vanity. The way we look often tells other people a great deal about us as people, and this is truer for our smile than it is of most other things. A clean, healthy, well maintained set of teeth gives the impression that you are a person who looks after themselves and creates an aura of good health and well being. That in turn can have a positive effect on all kinds of things from your job prospects to your love life. What's more, the feeling that your teeth, be they misshapen, discoloured or otherwise damaged, are letting you down can cause a massive dip in your confidence. Smiling, laughing, talking freely - they all become more difficult if you're ashamed of the state of your teeth. Lumineers are an alternative to traditional dental veneers which can give you, quite literally, a brand new smile. When teeth are damaged or decayed, they can cause pain and negatively affect the esthetics of your smile. Using porcelain crowns, the evidence of having your teeth restored is virtually undetectable. Your smile will be stronger and healthier while still looking natural and beautiful. Porcelain crowns fit over your natural teeth like jackets. They can make teeth stronger and less susceptible to fracture and damage in the future. At the same time, porcelain crowns can be used to improve the appearance of the teeth by reshaping them, changing their alignment, and making them whiter. A dental bridge is a false tooth used to fill the space left by a missing tooth by literally bridging the gap between the existing teeth. and increase bite strength. There are several options when choosing a dental bridge. If you tend to hide your smile because of missing teeth, dental implants can help. Restorative Dentistry includes all the procedures in the field of general dentistry that replace or repair missing, decayed or broken teeth. At Dr. Fattahi's office , we are able to restore your teeth back to a healthy, attractive, form and function. thus saving them distress both now and in the future. and friendly staff will do their best to address any concerns that you or your child have about checkups and necessary operations. Being told that you need oral surgery is not something any of us want to hear, but in actual fact minor oral surgical procedures are really not daunting. From simple extractions to the removal of impacted wisdom teeth; at Dr. Fattahi, staff are qualified and experienced to perform dental procedures as quickly and as painlessly as possible. Say the word root canal, and most everyone cringes. No one wants to hear that they need a root canal treatment at a dental office. However, our experienced staff at Dr. Fattahi office can make you feel more comfortable with your dental experience. We explain the whole process to make you feel more at ease. Gum disease is by far the biggest cause for tooth loss in adults. Known as a silent killer, gum disease is painless and often doesn't present itself until it's too late. Our services range from the standard "6 month cleaning" to advanced periodontal therapies including deep scaling. Your comprehensive examination will allow us to accurately assess the state of your gums and suggest a plan of treatment to return your gums and teeth to optimum health. 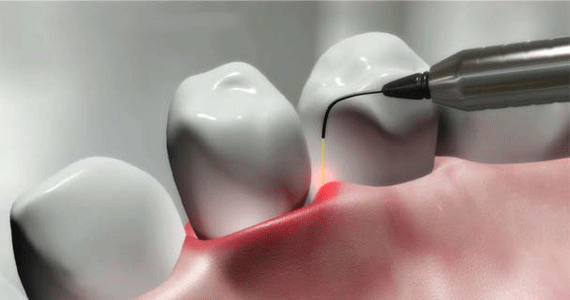 A laser uses light energy to perform the dental procedure and can treat the targeted tissue while leaving the surrounding tissues unaffected. Using laser dentistry allows Dr. Fattahi to perform some of the most precise procedures needed to help patients experience a healthy smile. Teeth whitening is one of the most popular ways to enhance your smile, and at Dr. Fattahi's office we offer you the full range of treatment options. so that you can restore your teeth to their natural whiteness. All of our teeth whitening treatments are safe and proven to lighten the shade of your style.